My latest lighting lesson is up on the Photoflex website. 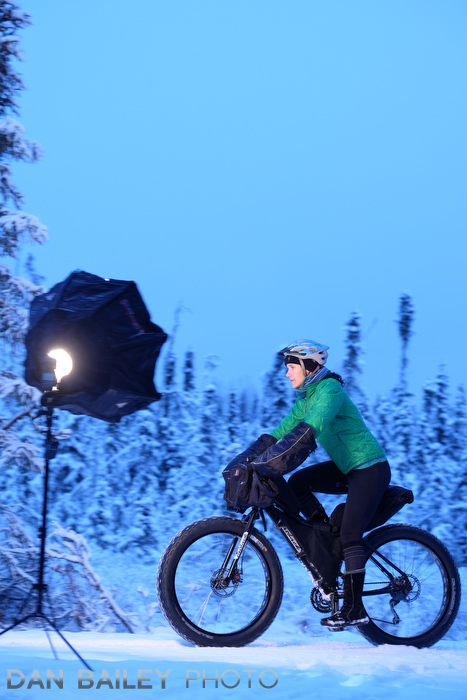 It’s called Mountain Biking Photography with Accent Lighting, and it features a lightweight and portable softbox called the HalfDome, which can be used with any kind of speed light. The Photoflex HalfDome is essentially a half-width softbox. It’s big enough to function as a main light, but with its narrow profile and a removable mask, it works great as a strip/accent light that can add additional creative style to your photos. The small version of the HalfDome packs quite small and it hardly weighs anything, which makes it very easy to carry to when doing location photography, even outside. My lesson details all of the gear I used during the shoot, as well as the lighting techniques and placement I typically use when I’m photographing action and outdoor portraits with off-camera flash. And how to keep your softbox from blowing over when you’re trying to shoot outside in the wind. Read my lighting lesson here. 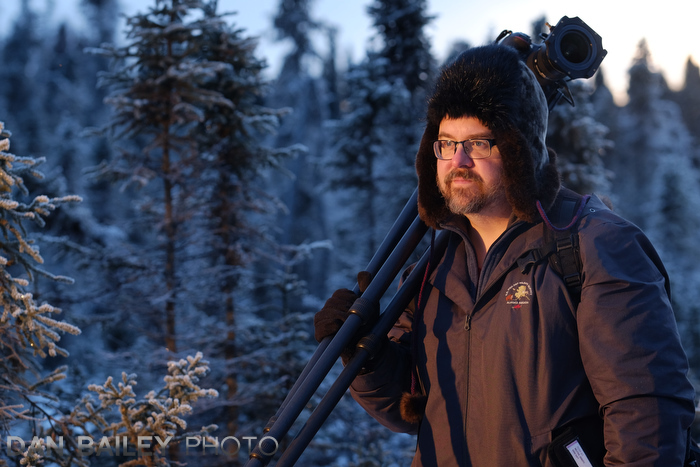 If you’re interested in more information about my off-camera flash techniques, check out my eBook, Going Fast With Light – A Flash Guide for Outdoor Photographers. Back when I first started with photography, over twenty years ago, I spent many rainy Saturdays at the Boston Public Library, lost in the stacks as I pulled down book after book, trying to learn as much as I could about the craft. I gained so much of my initial technical and compositional knowledge from books, and two decades later, I’d say that notion still applies. I’m constantly reading books, eBooks and blog posts trying to pack my brain with additional knowledge. While I’ve gained valuable info from so many different authors over the years, there are a few titles that really stand out in my mind. Here are the three photography books I feel have made the biggest impact on me. I highly recommend any and all of them. 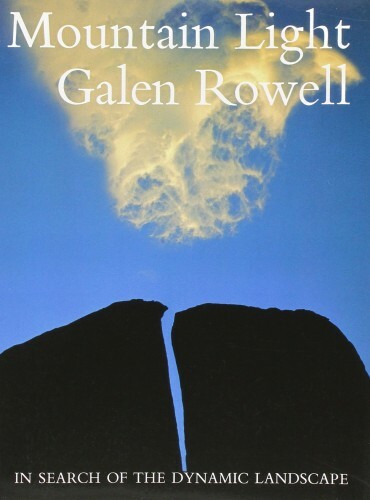 Mountain Light by Galen Rowell has always been #1 in my book; it’s my all time favorite landscape and outdoor photography book. Galen Rowell was a remarkable human being, and his legacy with outdoor and adventure shooters will live true for a very long time. Not only was he a great photographer, he was an accomplished climber, mountaineer and explorer, he was an amazing writer. Where many books give you the nuts and bolts, Galen always gave substance. Going far deeper than “use this technique” or “I use this camera,” he wrote with a high degree of intelligence and insight about the creative, technical and philosophical considerations that influenced his own work. Mountain Light goes deep, laying out his process for 80 of his favorite adventure, travel and mountain landscape images. 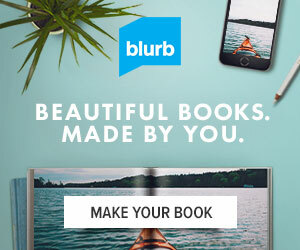 With well written essays and thoughtful introspection, Galen covers how to see like the camera and how to translate your own personal vision into a strong images, often by going that extra step, even if it meant running two miles at 15,000′ to line up a rainbow with the best subject matter. My own copy of Mountain Light is well worn, and I still pull it off the shelf from time to time. Even after all these years, I always find something new. 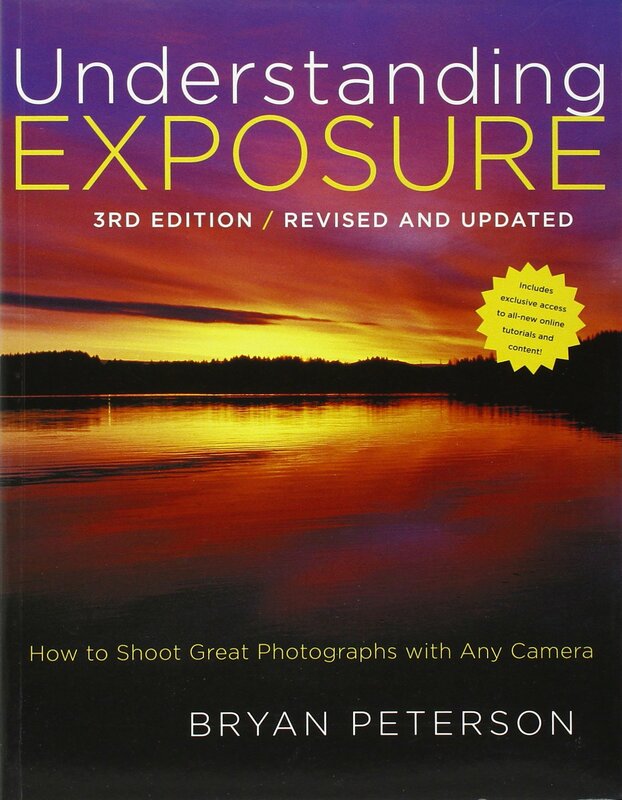 Considering that Understanding Exposure is one of the best selling photography books on the market, I’m not the only person who thinks that this is one of the best beginning photographer books out there, if not THE best title for people who are new to the craft. 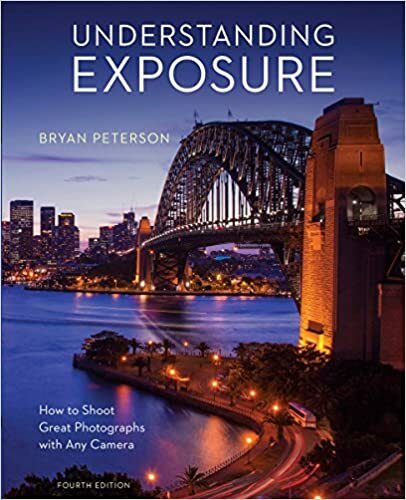 Written in an very easy to understand style, Bryan lays out the basic technical concepts that every photographer should know. With detailed chapters that cover the basics of exposure and the relationship between aperture and shutter speeds, he shows you how to understand and use them in creative ways. Bryan also talks about how to use the different qualities and directions of light, and he covers techniques such as blur, panning and macro. 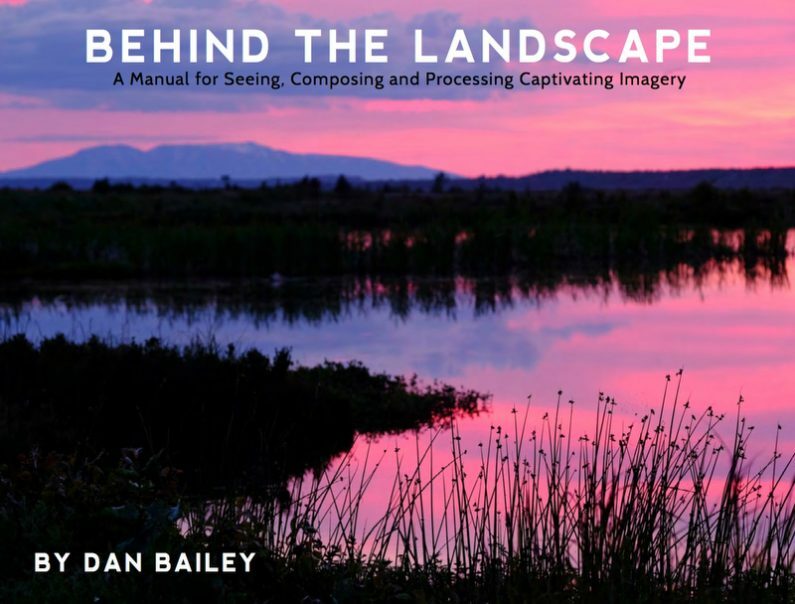 Written in 1990, the updated 3rd edition is full of info that’s applicable to digital cameras, and even includes a section on multiple exposures and HDR. Understanding Exposure is illustrated with simple, graphic imagery that clearly shows off not just each concept, but that the best images are often the most simple with regards to subject matter and framing. 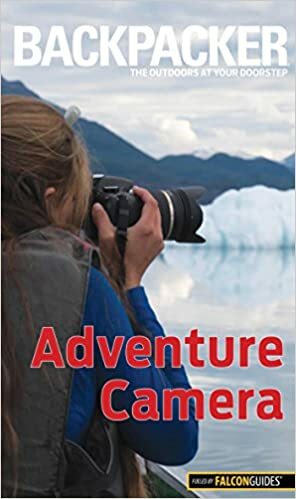 I learned a ton from this book when I first started out and I would highly recommend it to any photographer who’s new to the world of cameras and image making. The Hot Shoe Diaries is a much more recent influence. I stumbled across this book a few years ago, and it made a huge impact on me. I read it, as many photographers have, during a time when I was trying to improve my flash photography. Joe is the undisputed master of the Speedlight, and whether he’s using a bare bulb flash, or any kind of diffuser, big or small, store bought, homemade or improvised, he makes light that sings. Light that highlights his subjects with the most beautiful, amazing, appealing, and sometimes subtle light you can imagine. 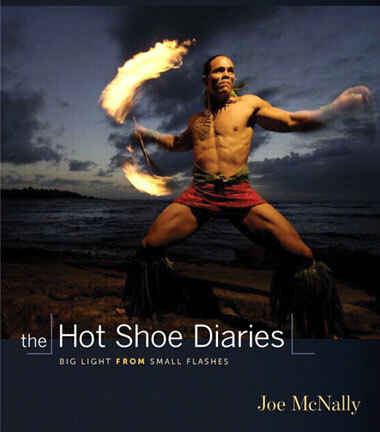 I read The Hot Shoe Diaries in just a few days Then I turned around and read it again. Then, a third time, but with a notebook in hand. I wrote down bullet points, technical and creative tips and gear options that I gained from each chapter. Having done this, I feel my flash skills have climbed by leaps and bounds. I have so much more confidence with flash now, and even though I’m shooting Fuji cameras now, I still use my Nikon flashes, and I still use the techniques I learned form this book. 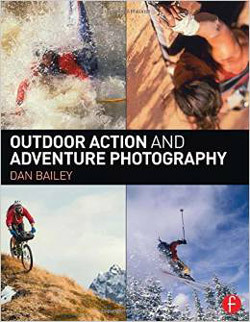 If you shoot flash, for portraits, location or even action, I would highly recommend this book. I changed my life and it can change yours. For further reading, here is a list of the top photography books recommended by my readers. One of the big questions that many photographers have regarding the Fuji X-T1 and the other X Series cameras, is how well they work with flash, especially of-camera flash. While Fuji does have a few flashes in their lineup, they don’t (yet) have anything as advanced as the Nikon CLS system, which features things like TTL monitor pre flashes and infrared triggers. However, Fuji built the X Series cameras to be compatible with most of the wired and wireless flash systems. They work with PocketWizards, Cactus triggers, and both Canon and Nikon sync cords. I’ve even used my Nikon SB units in the hot shoe of the X-T1 and they work fine. Keep in mind, they only work in Manual flash mode. You can’t pair a Nikon or Canon speed light with the X-T1 and expect full TTL, but you can use it as a main flash, and you can even use it to fire other flashes. 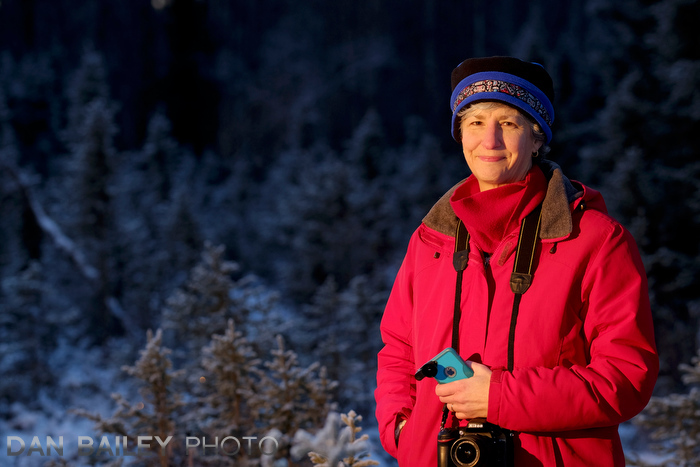 However, anyone who follows the work of Strobist David Hobby knows that Manual flash is hardly a limitation. You can do amazing work with one or more flashes that are all set to M.
In this post, I’ll just cover a couple of techniques you can use when shooting off camera flash with the Fuji X Series cameras. For both of these examples, I’m using the flagship X-T1. It has a sync speed of 1/180, which isn’t bad. 1/250 would be nice, but for most things, 1/180 works just fine. 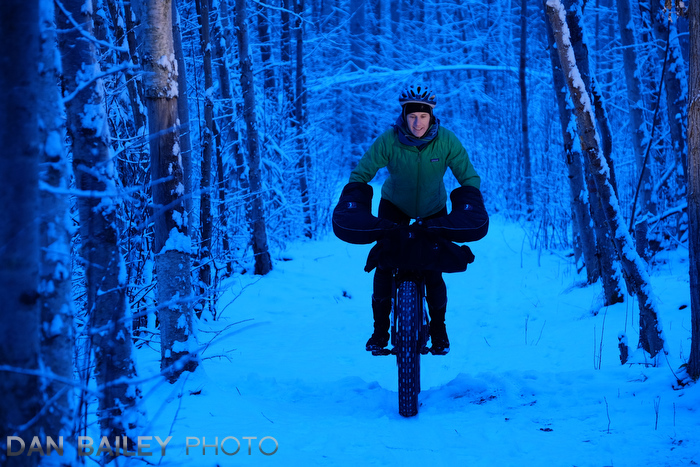 In these first two snow biking images, I’m using the X-T1 camera with the XF 50-140 f/2.8 lens. For the light, I have a Nikon SB-900 that’s fit inside a Photoflex 3-foot OctoDome softbox. 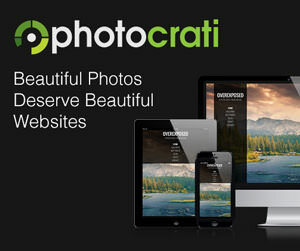 I’m a huge fan of Photoflex soft boxes, they’re relatively inexpensive, quite portable, and very durable. 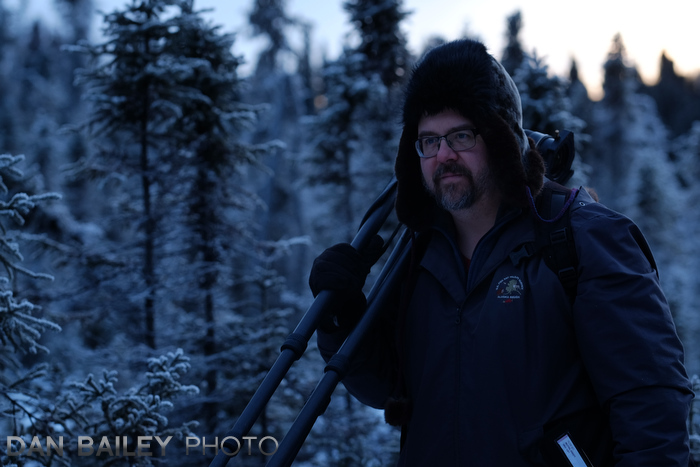 Believe me, I’m pretty hard on my gear and the Photoflex stuff holds up to a great deal of abuse. To trigger the flash, I’m using a pair of PocketWizards. Old ones. Plus II models that I’ve had for about fifteen years. They’re simple and very reliable, as are any of the PW Plus Series. If you’re new to radio triggers, the new PocketWizard PlusX models are a great value. You can get a pair of them for about half the price of what a single Plus II model used to cost. If you need multiple channels and longer range the Plus III is the way to go, but for most flash work you’ll probably do, a simple trigger, inexpensive trigger like the Yongnuo RF-603 II will work just fine. You can get a pair of wireless triggers and be off camera flashing for only 30 bucks. Plus they’re tiny. I’ve never used the Cactus triggers, but from everything I’ve heard, they’re really good, reliable solutions for off camera flash. The latest ones are the Cactus v.6 models. As you can see, there a lot of options. In this first example, I’ve set the camera to Tungsten White Balance. Then I use an orange CTO gel on the flash, which counteracts the blue. Why switch the while balance? The effect will be that everything lit with the flash will look normal, while the background retains a cool, moody blue light. It’s a nice effect that can give you a very interesting look. At left, you see in this shot above, the scene with Tungsten WB and no flash. Its really dark inside the forest on a winter day, which gives the scene a very drab look. Not so good. A perfect scene for adding flash. 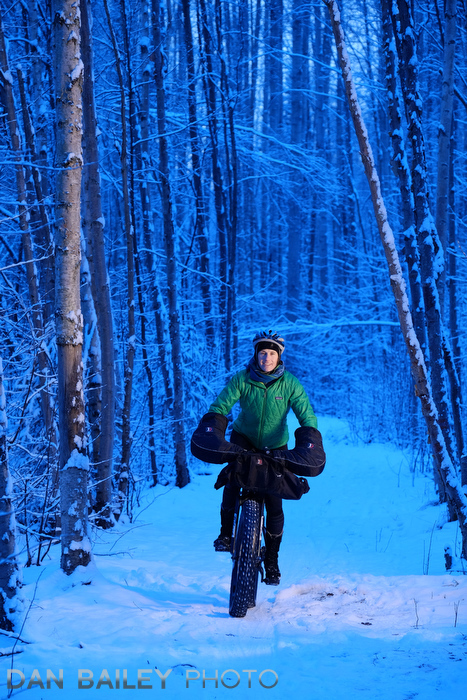 Here, I placed the flash inside the trees just off the trail, so that it would hit the biker from 90 degrees as she rode by. Of course, this technique can be tricky. Since you may only have one shot each pass, you’ll have the nail the timing, or you’ll miss the light. Focus can be tricky too. 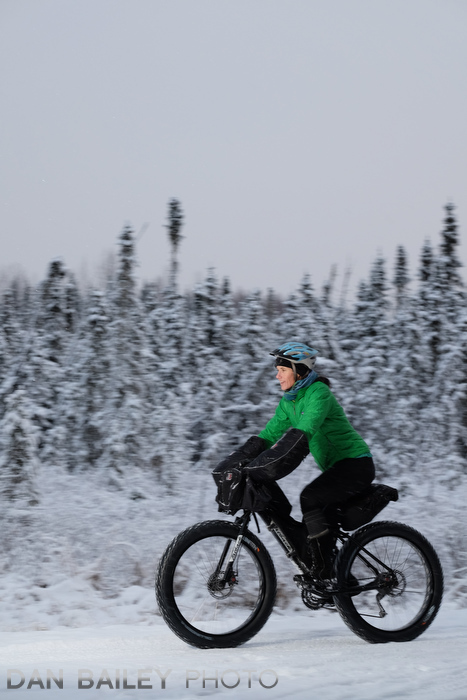 Here, I put the X-T1 in AF-C AF tracking mode, and the 50-140 had no trouble finding and locking on the subject while she rode up and down the trail. In some situations, you may need to pre-focus on a set point and then fire the shutter just when the subject reaches that point. Camera and flash exposure was set as follows: 1/180 sec. @ f4, Manual Exposure mode, with flash set at around 1/8 power. It always takes a few test shots to figure out the appropriate flash sheeting. That big 3′ OctoDome puts out a lot of light, so I didn’t need very much coming out of the flash. Plus, its angled the light up quite a bit so that it wouldn’t blast too much onto the snow, since its got such a wide wrap. A grid would have worked well here. Here’s the scene with not quite enough light, I think set at 1/32 power, and then the final version. 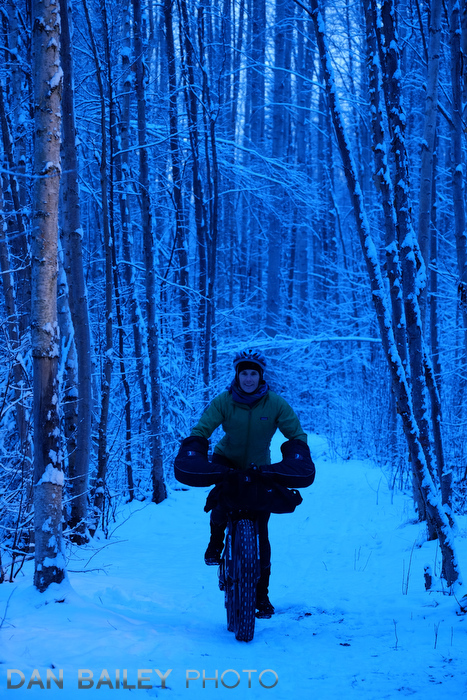 Sometimes Tungsten White Balance doesn’t always look quite right. For this next scene, I switched to Cloudy White Balance and removed the orange gel from the flash. Here are the two versions to show you the difference, as well as my light placement. Flash exposure was set to around 1/8 power, and in the final shot, I dropped the shutter speed to 1/60 sec. in order to show a little bit of motion in the subject. For this scene, the crux wasn’t focus, it was timing. It took a few passes in order to get the right framing where the biker was on the right side of the frame and the flash wasn’t in the picture. Flash photography often takes a certain level of trial and error and trying things a few times before you nail it. For these last couple of shots, I used a pair of bare bulb Nikon SB-700 Speedlights, one sitting in the hot shoe of the X-T1, and the other held by a friend off to the side. The flash in the hot shoe was set to Manual mode and a very low power setting, around 1/128. Its job is not to light up the main subject, but to trigger the second off-camera flash. It was swiveled to point directly at the second flash. The second SB-700 was zoomed to around 85 mm, to get a nice strong direct beam of light, and set to SU-4 mode, which is Optical Slave Mode. In this mode, the flash fires whenever it ‘sees’ the light from another flash. So, you could use ANY flash in the hotshoe, and for a second light, any flash that has a wireless slave mode. 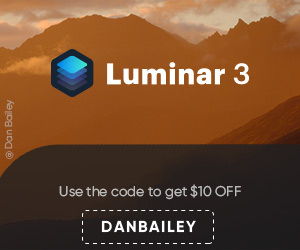 Your best value is probably the Lumopro LP180 Strobist model. 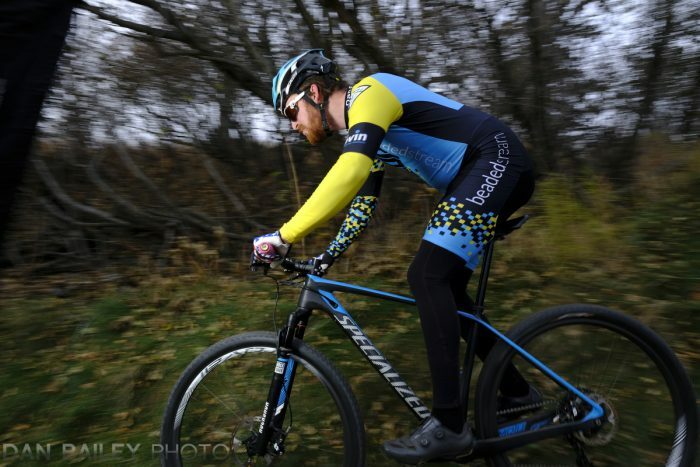 Nissen recently released the i40 Flash for Fuji. You can read a review of this flash on Fstoppers. For of these scenes, I used Auto White Balance white balance and the orange CTO gel on the flash. Again, the X-T1, but this time, I’ve switched to the Fuji XF 90mm f/2 lens. So, to wrap up, your flash options using the Fuji X-T1, or any of the Fuji X Series cameras, is pretty much wide open. 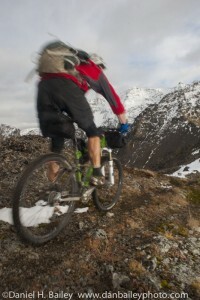 Although you lack the precise remote control of the Nikon CLS system, you can do a lot with Manual flash. Really, the limitation of manual is that you have to walk around and change each light by hand, so basically, we’re just talking time. Once you’ve got it all dialed in, the light quality is exactly the same. When I sold all of my Nikon DSLR last year, I kept all of my Nikon flashes, because they still work fine with my Fuji system, and as you can see, in a number of ways. Really, all you need to get going is a single flash and either a sync cord or a couple of triggers. After that, it’s all about experimentation. 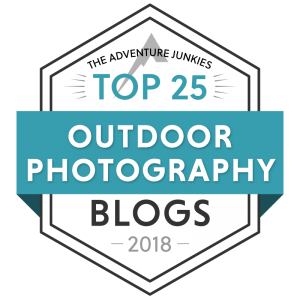 For further and expansive reading on off-camera flash techniques in the outdoors, check out my eBook, Going Fast With Light. 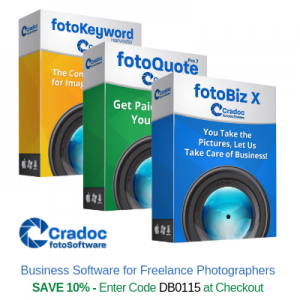 While the gear might very, all of the techniques I describe in my eBook are applicable with both DSLR gear and mirrorless cameras. And it’s on sale right now.